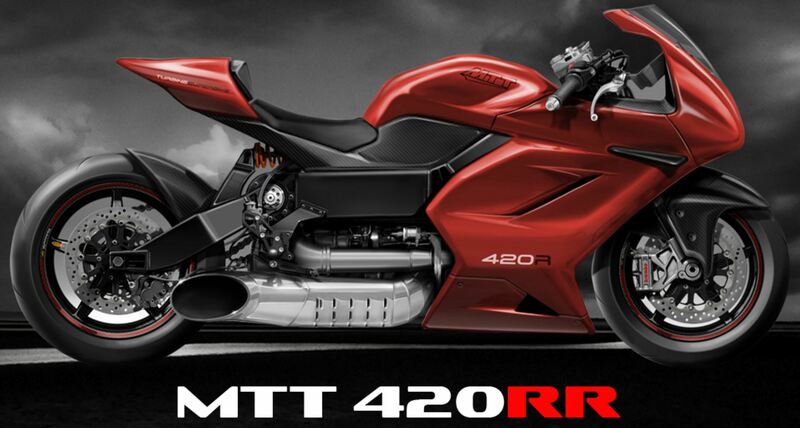 Meet MTT 420RR Turbine Superbike with 440 KMPH Top Speed! If a closely passing Ninja or CBR brings goosebumps to your soul, this turbine powered 420 HP MTT 420RR will surely take things to a next level. The name MTT has been heard before many times, mostly with the legendary Y2K, which has been tagged as the first street legal turbine powered motorcycle of the world. Marine Turbine Technologies has delivered every 320 HP Y2K to the customer with 100 percent customization option, bringing their favorite shades and patterns alive on this legend. After its completion, the 420 HP MTT Street Fighter came into existence and brought more fame to the brand name. Shortage of power was never a problem to MTT while the designs were showing their age within the sharp and highly aerodynamic current age motorcycles. The new MTT 420RR is actually Race Ready superbike and comes with a design which matches and even shames some of the renowned performance bikes around the world. The new age motorcycle comes with a Rolls Royce Allison – 250 – C20 Gas Turbine producing 420 HP @ 52,000 rpm and 678 Nm of torque at just 2,000 rpm. It comes mated to a 2-speed automatic gearbox and weighs just 227 kg. The bike runs on a mixture of diesel and kerosene. While the top speed is unknown at the moment, many sourced reveal it to be more than 440 kmph. The last generation Y2K was once raced with a Bugatti Veyron and the results were simply eye popping. The car went on to touch 180 kmph in 5.4 seconds while the MTT bike was at 320 kmph. Imagine if it was with 320 HP, the MTT 420 RR with 100 HP more can simply shatter all of the records. The rider must have glued himself to the seat. The design is mind blowing, the power figures feel not for the ground and still it is the best 2 wheeled thing on Earth. Yes, it can literally compete with anything and win without much effort. The long wheelbase and carbon fiber parts make it really a stable machine. It even offers a rear view camera and a LCD screen.